Volume Ill, Number 37 PUblished by Students of New College, Sarasota, Florida. fire Destroys Barracks Building Fire razed one of the old barracks buildings on the college's East Campus late Monday night. There was nothing in the barracks when it bwned down, and according to Director of the Physical Plant W. A. McVickar, the college was planning to tear down the particular anyway. For another picture, see page 3. (Photos by Bruce Guild) Minister Appointed As Counselor A retired Air Force chaplain has been appointed a special cotm.se lor to students in conjtm.ction with the Dean of Students office. The Rev. Horace N. Cooper, who since his retirement from the scheduled to be in Hamilton Center Wednesday afternoons, Thursday evenings, and Friday afternoons. 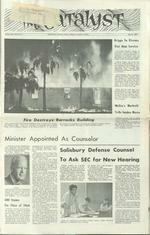 Salisbury Defense June 2, 1967" Briggs To Discuss Viet Nam Service Army Capt. Donald T. Briggs, on leave after a year's tour of duty in Viet N am, will talk about his experiences in Southeast Asia and show slides of the area at tonight's Forum at 7:00 in Hamilton Center. Captain Briggs, who serves with the U.s. Army Artillecy, is a six year veteran of the serviceS, having joined the army in 1962 after graduating from Sarasota High School and attending the University of Florida. Commissioned after completing Officers Candidate School, Captain Briggs was stationed at Fort Sill for several years and then served as an advisor to the Vietna mese Army in the Kontum area, which is located in the central highlands of South VietNam, Slides that he will show were photographed by Capt. Briggs during his service in South Viet N am. He will discuss the military operation there and after the slide showing will conduct a question and answer period. Welles' s 'Macbeth' To Be Sunday Movie Stmday1s movie will be Orson Welles's 1948 productio n ofShakcs peare's "Macbeth. The 85-minute film was produced and directed by Welles, who cast himself in the lead role. The program will begin at 8 :30 pm in Hamilton Center. Counsel Information Officer Funnan Arthur indicated several others will be appointed on .1 similar basis to counsel with students. Rev. Cooper joined the United States Army as a chaplain in 1936 after completing his education and after spending three years as a pastor in his native Colorado. He also was director of the National Youth Administration in the westem part of Colorado. To Ask SEC for ew Hearing Cooper service in 1959 has been associated with the First C ongre gat ion al Church in Sarasota, will be on campusthrce days a week to meet with students. He is tentatively GRE Exams For Class of 1968 Graduate Record Examinations for second-year students majoring in chemistry, math, economics, history, political science, psycholgy, and sociology will be given tomorrow at 8:30 am in the teaching auditorium in Hamilton Center. Results of the exam will be used tohelp students identify their academic strong and weak points. Educated at the University of Denver and Nashotah Theological Seminary, Rev. Cooper was an Army chaplain for three years before switching to the Air Corps. In 1948, with the unification of the services, he served with the U S. Air Force tm.til his retirement. During his long military career, Rev. Cooper served in many parts of the world, including Alaska, Canada, Japan, Okinawa, Korea, North Africa, Italy, Scotland and England. He was staff chaplain for seven years with Gen. Doolittle's 12th Air Force and with the Fifth Air Force during the Korean War. At one time, he was the administrative chief of a group of more than 200 chaplains. In 1953, Rev. Cooper organized and commanded the first U. S. A. F. school for chaplains. He retired as a lieutenant colonel. In addition to his interim duties with the Congregational Church in Sarasota, Rev. Cooper is one of the original trustees and was the secretary of PlymouthHarbor. He is also president of the Board of Directors of Community Services, Inc., a non-profit organization assisting migrant workers. Defense counsel for a student charged with violation of the intervisitation rule will move for a new hearing at Wednesday's Student Executive Committee meeting. Third-year student Tom Todd, acting as counselforsecond-year student Luke Salisbury, said he would make an appeal to the SEC after the Student Judi cal Commit-tee denied him a new hearing at its meeting last night. The S ]Chad bound Salisbury ovflr for trial at last Thursday's meet ing. The trial has been set for W ednesday, 7 : 30 pm, in the teaching auditorium of Hamilton Center. Salisbury is accused of violating intervisitation hours May 22 Three alleged co-violators--first Todd, left, argues his case on behalf of Ellen Tisdale, center, and Pearl Lefkowits, at yesterday's SJC meeting. year students Helen Hickey, Pearl Lefkovits, and El len Tisdale-pleaded nolo c ontendere at last week's hearing. They were given wamings. At last night's hearing, Todd said he was representing these three students, aswell, and moved f o r new hearings for all four clients. Todd contended since no official recordofthepreviow week1shearinghadbeenkept, he did not know what evidence had been presented against his clients and was thus handicapped in preparing a defense. Tildaletold the S]C those who had pleaded nolo contendere did so under the impression it was different from a guilty plea, and the prosecution would still have to prove its case before the judges. She claimed no evidence was in fact presented. Second-year student Dale Hckam presided at last night's meeting and denied Todd's motions to dismiss, to re-hear, and postpone the cases. Hickam will preside at the trial. Second-year student Tom Manteuffel and third-year student Dave Hartley will also serve as judges. Second-year S]C members Rick Stauffer and George Finkle, who disqualified themselves from passing judgment, will join the othersto sentence, if necessary. Page 8 1 Rubber Sand' a The Catalyst June 2, 196 7 Hit at Surprise Dance The "Rubber Band" proved a hit with the students when they provided four hours of discotheque music at a surprise dance in Hamilton CenterSaturdaynight. The dance and the band were apparently sponsored by Recreation Coordinator Frank Meyer. Starting from above, clockwise: the dance floor from the Rubber Band's vantage point; The Rubber Band from behind stage; New College first-year student Craig Schenck jamming on his harp during intermission; some vigorous dancing. ( PHOTOS BY JET LOWE ) Tickets for June 10 Dance Available at Reception Center Tickets for New College's year end dance are now available at the Reception Center from recreation directorFrankMeyer, according to social committee chairman Karle Prendergast. Tickets for the June 10 affair, to be held in the ballroom of the John Ringling Towers Hotel, will be $1.00 per person, $2.00 for non-student dates. They will also be available at the door. Prendergast said with of the student body expected at the dance, and 2/3 ofthe faculty and adm inistration, about $100 could be expected to be returned to the Student Activities Fund. She said Meyer contributed $85 from the recreation budget for the dance. The dance will begin at 8: 30, and will continue as a formal affair until midnight. The dance will be informal from midnight until 2:30 am. The Galaxies of Tampa will provide the music. A buffet will be served by the John Ringling Towers from 11 pm to 12:30 am. Prendergast said the the menu would include: steam boat roast (roast beef), seafood Newburg, two vegetables two potatoes, appetizers, hot rolls, beverages, a salad with 10-15 items and a desert bar featuring varieties of cakes, pies and ice cream. Prendergast said only students 21 years of age or over would be permitted to use the hotel's bar, and said students are requested to use the front entrance of the hotel in entering the dance. The John Ringling Towers on U. S. 41 will be the site of this year's year-end dance. Above, the main entrance to the building. Left the main dining hall.